They will have a succah - seats 18 people. Because it's small, they don't take reservations for it. Recommendation is to get there early or off hours, as they serve all day with no break, in order to eat outside. They will have 2 succahs with seating up to 35 people. as well as a private succah on the rooftop for 30 people. On the street level, they will have a beer garden succah available for people during chol hamoed only. Dinner starting at 5:30pm. Ala carte menu will be served. 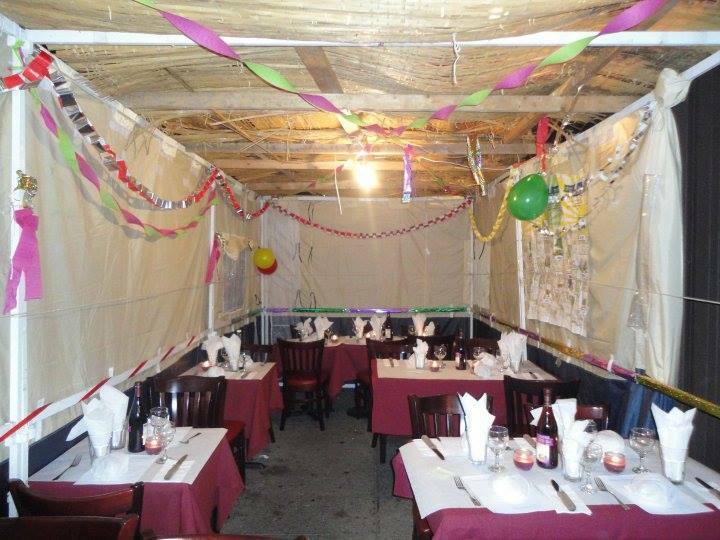 Talia's large outdoor cafe will be converted to a large succah (see photo above). They are offering 3 pre-paid, prix fixe menu options: $31, $42, or $54 and they will offer two seatings for dinner: Early bird dinner 5:00pm to 8:00pm (flexible) and dinner 8:00pm to 11:00pm (flexible). They will have a succah in the restaurant and they are going to having a kiosk by Luna Park on Chol Hamoed Succos. There succah can hold 80-100 people. They will have a succah. (w/ $15 min. - 2 mile radius) & Curbside Service. Succos Special: Buy 1 Waffle, Get Ice Scream Scoop FREE. as in the past 25 years will have a full waiter service succah holding 25-30 people with their complete, amazing Chinese/Sushi/Japanese menu. Please be advised that they will be closed for the duration of the Jewish Holiday period, with plans to reopen on Monday, September 30. While they are closed, they are working on a revamped menu and a revised concept. Their large succah (sits up to 60 people) will be located behind the Barclay Café in the Barclay Farms Shopping Center just a few doors down from the Cherry Grill. They, along with the Sukkah, will be open Sunday, Monday and Tuesday, 9/22-9/24 from 11am - 10pm. Cherry Grill will be closed during the holiday. will be offering separate swimming for men and women and kosher food in the succah will be provided by Esti's. Call for curbside pickup and they will bring it out to your car. Dinner deal- Call it in the air for a chance to win 20% off your entire order. They will have a full service succah for 48 people with the same elegance as their indoor dining room. Yom Tov special for platters ordered in advanced will receive a 10% discount and 15% discount on 2 or more platters ordered. Pick up September 18th, delivery available. We will run a different special appetizer, entree and dessert each day of the chol hamoed in connections with Succot. (Etrog, dates, palm tree leaf). They'll be open for lunch and dinner service September 22, 23 and 24 - and for lunch September 25. Tierra Sur's Succahs are available by reservation. Orders must be placed by Monday, September, 16th. Food will be available a la carte Wednesday, Sept. 18th on a first come, first serve basis. They will have a succah which seats around 25 people and will be offering a special menu and chef specials.